Trained dogs running around the barrels in the correct pattern is a site to behold...a trained barrel dog with a saddle and little doll or stuffed animal rider, just adorable! 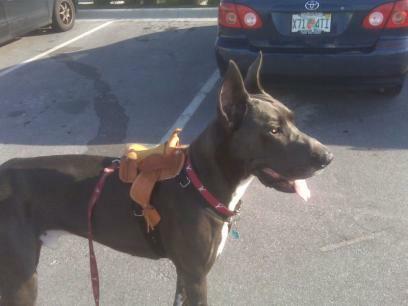 You can get creative with the saddle and the rider your dog will use. 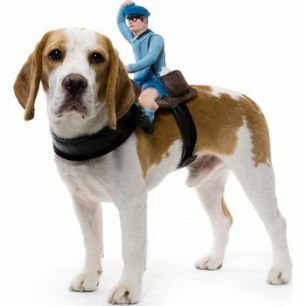 It might set you apart from the other competitors and folks might now remember your name or your dog's name, but they will remember that you and your dog were the ones with that "cute saddle and rider". 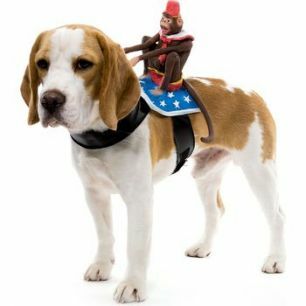 Of course we will have to give the Rodeo Border Collie with the monkey, Whiplash, (not him in the photo of course) a lot of the credit here for getting these dog Rodeo Games off to a great start. Everyone loved the Taco Bell commercials they were in, especially the Christmas one where they decorated the tree. Did you know that Whiplash stars in Rodeos all over the country, and did so before the commercials? Barrel Racing Dog Saddles are for look only. It adds a bit of fun to the sport. You can race with or without a saddle and or rider. But for the Flare of the Sport, to catch Spectators eyes, for the fun of it, adding a saddle and little rider, when done correctly, can sure add to the fun. 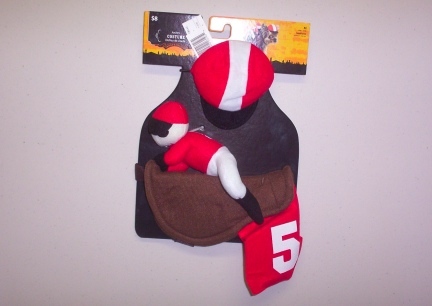 I have seen some pretty cute little saddles with rider dolls on the. I made this (photo coming) backpack for Mr. Bo Jangles several years ago and made others for other dogs I have owned before that. This one is great, you can put items in it out of your purse, a snack and off to the Parade. I plan to make Frankie a saddle and buy him a rider, perhaps a bear, very soon. I will post a photo when it all comes together. 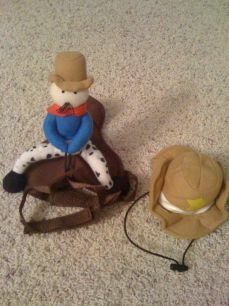 Mr. Bo Jangle's Backpack would not be a good Barrel Racing saddle. Just like horses need certain saddles for certain jobs. Barrel Racer's have Barrel Racing saddles for their competition for a reason. Horse Barrel Racing Saddles are lighter weight then the average Western Saddle, it has a saddle horn a small lady's hand can grip well, as well as other features. Your dog will need also a "barrel racing saddle", a light weight, well fitting, soft sided saddle for running barrels. 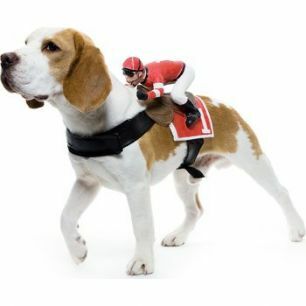 Whether you purchase or create your saddle and or rider, make sure it fits your dog correct and make sure that your rider is proper size and stays upright as the dog runs the course. Sew or velcro the rider down very well. 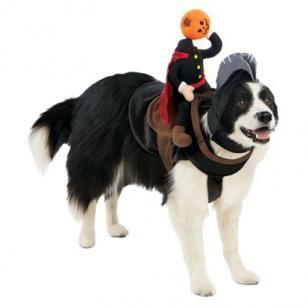 It will surely distract the dog if the rider falls off or the whole saddle slides sideways during a run. 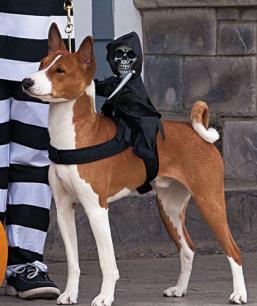 A saddle that is not attached to the dog properly can irritate the dog as it runs. 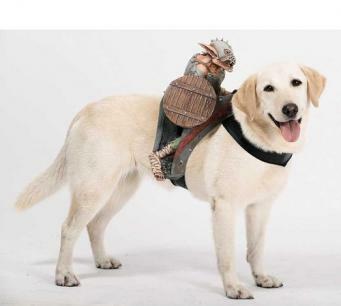 A rider that is too big for the event can distract your dog on each barrel it turns. 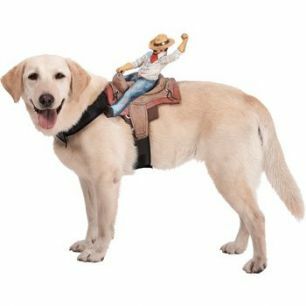 As you can see from the photos on this page you will/would be able to purchase from a variety of Dog Saddle with Riders. (who knew?) These items do come in sizes, measure your dog or try it on your dog before you purchase the one you choose. 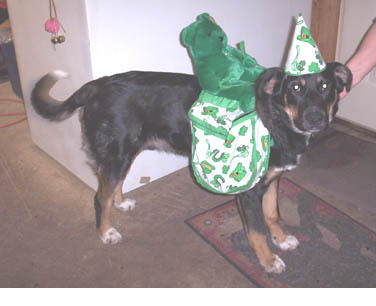 Train your dog to wear it, while out on a walk, long before you have your dog wear it when running the barrels. 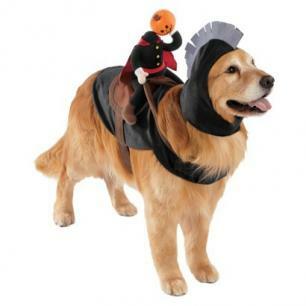 In fact do not put the Saddle and Rider on the dog while running the barrels until your dog is well trained. Never let your dog chew on, bite at, or pull it's saddle off it's own back. Big Dogs can run barrels too.....and wear saddles as they do. Any size dog, Giant and or Teacup size dog, can and probably does run barrels. Rest assured you will be able to either find and buy them a saddle and or create them one you craft yourself. Ever hear "When there is a will, there is a way"? or how about "If at first you don't succeed, try try again."? 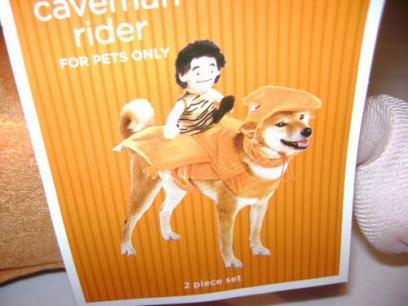 If you really want your itty bitty dog or your giant dog to participate, they sure will be able to. 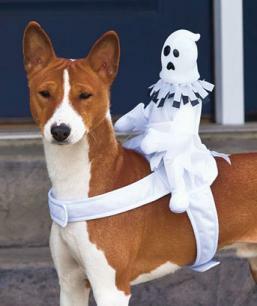 Your saddle, in my opinion, needs to be small and soft enough for the dog to run well. You do not want hanging, loose fitting stirrups to distract or get hung up or hit the side of the barrel as the dog runs. Hard leather will need to be well padded, not for the rider, but for the comfort of the running dog. The saddle needs a breast strap and a cinch strap to stay in place securely as the dog runs the curves. You might want a different colored saddle than everyone else has, such as Bright Orange or Turquoise Blue. Something different that stands out. People will come to recognize you by these types of things. In my own opinion. This would of course be up to each dog owner. 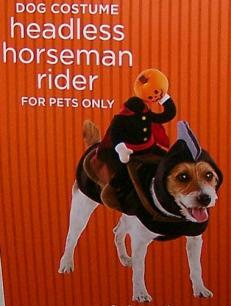 But in my opinion, this type of full costume would be a bit much for a dog to wear while running barrels. The hat is not going to stay on the dogs head as it runs and turns the barrels, unless it is far too tightly strapped on the dog's head, so the hat will flop on the dog's face, or fall off the dog as it goes on it's round on (turn on) the barrels. 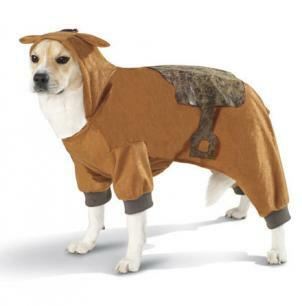 On a warm/hot day the costume is going to add warmth to your dog making the dog uncomfortable. But each saddle is the business of the owner and or the judge that day at any event. 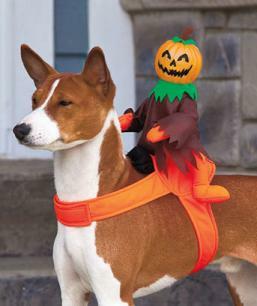 Personally, I think a simple saddle with a very small rider is cute on the dogs running the course, but you can sure overdo this sort of thing. I HAVE SAID IT BEFORE AND WILL SAY IT OVER AND OVER AND OVER AND OVER. IF YOU ARE GOING TO ADD A SADDLE ON YOUR DOG'S BACK FOR RUNNING BARRELS, MAKE SURE IT FITS CORRECT, HAVE YOUR STRAPS SNUG BUT NOT TOO TIGHT ON THE DOG, BE SURE THAT THE RIDER IS NOT FLOPPING AROUND TO BADLY WHILE THE DOG IS WEARING IT AND RUNNING, MAKE SURE THAT THE OUTFIT DOES NOT INTERFERE WITH YOUR DOG'S MOVEMENT (check to make sure there is no rubbing of the dog's skin under the dogs armpits on it's front legs), MAKE SURE YOUR DOG IS COMFORTABLE WEARING IT, HAVE YOUR DOG PRACTICE AT HOME WEARING THE SADDLE BEFORE YOU TAKE THE DOG OUT IN PUBLIC WITH THE SADDLE ON (start your dog's first few times wearing the saddle while on short walks, make it fun for the dog to wear the saddle), AND ABOVE ALL, MAKE SURE THE COSTUME IS COMFORTABLE FOR THE DOG TO WEAR AND RUN WHILE WEARING IT (this includes training the dog to be used to wearing it on it's back). The contents of this page for Saddles & Riders is still under construction. Please check back later!